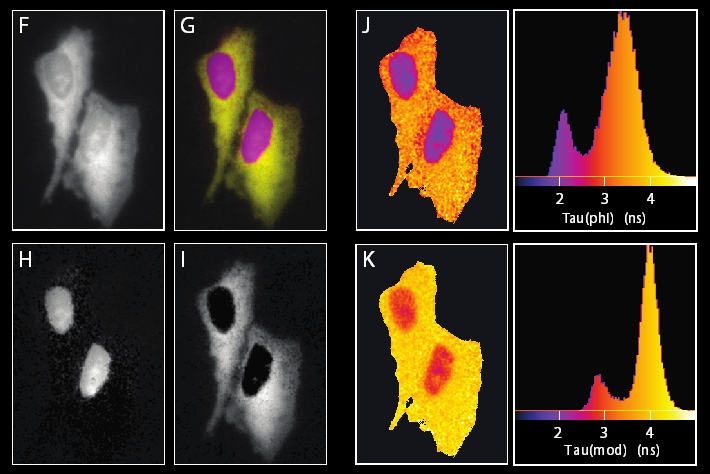 Fluorescence lifetime imaging microscopy (FLIM) can be used to study protein-protein interactions by FRET or to perform lifetime-based multiplexing. Mostly live cell imaging is performed for FLIM imaging, but in combination with (antibody) stainings a fixation step is required. Nevertheless, the effect of fixation methods and mounting media on fluorescence lifetime has been poorly documented so far. Comparison of lifetime in HeLa cells producing the fluorescent protein mTurquoise2 show similar intensities for live (A) and fixed (B), but a significant loss in lifetime (B (live), D (fixed). Figure E show lifetime effect in live cells and cells after fixation. This decrease in lifetime is not caused by fixation on its own but due to mounting in commercial mounting media. Mounting samples in Tris buffer results in more accurate lifetime measurements for single lifetimes of commonly used fluorescent proteins as well as FRET measurements. Furthermore, we demonstrate identical lifetime contrasts in HeLa cells expressing a single plasmid showing two lifetime variants of one single color fluorescent proteins.